Today I thought I'd (finally!) 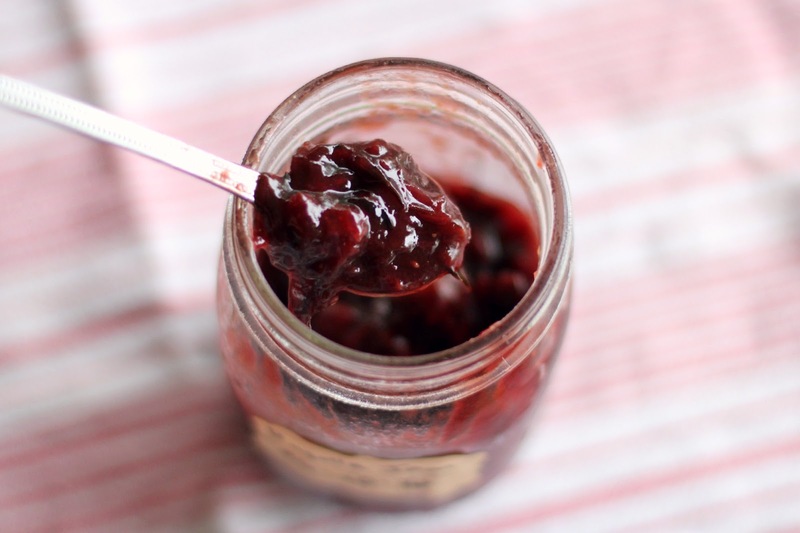 share my rosella jam recipe with you. In case you missed Thursday's post, click here for the cordial recipe and more information about rosellas. Jam making is one of those things you just can't rush. Whenever I have attempted to make preserves in a hurry, or if I'm distracted with other jobs, it's never turned out. For jam making to work I need to have time on my hands and be feeling calm. It's an enjoyable process altogether. I picked the fruit for this batch of jam several days before I found a day quiet enough to make it. Luckily rosellas keep quite well in the fridge for about a week. Rosella jam would have to be one of the easiest jams to make too, seeing as all you need is the fruit and a sweetener. You don't need pectin from any other source - it's prepackaged for you in the little green pod inside the fruit. How clever is that? This is such a beautiful product. It's vibrant colour looks so pretty on a plate. It's traditionally served with roast lamb, but I enjoy it with any roast meat, on sultana scones, sourdough bread - anything really. I'm not a sweet jam person and enjoy the unique flavour and delicate tang of the rosella. You need two ingredients for this jam. Ripe rosellas, picked when the pod in the middle is green, and rapadura. You'll need 1 cup of rapadura to every 2 cups of petals. 1. Rinse the fruit if necessary. Pull the petals off the green pods and put each in a separate bowl. Measure the petals now so that you know how much sweetener to add later. Put a plate into the fridge for to test the jam later. Sterilise your jars. 2. Put the green pods into a saucepan and cover well with water. 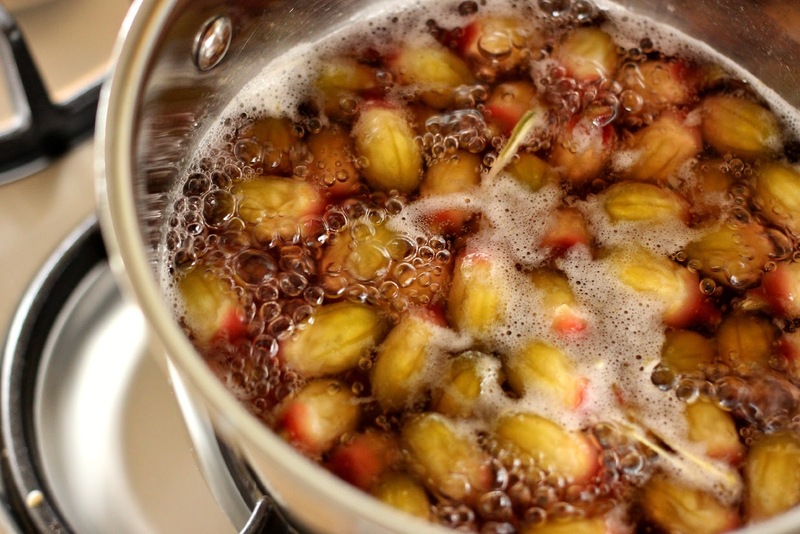 Over a medium heat, simmer/gently boil the pods for about 40-60 minutes, stirring frequently. You may need to top up the water a little from time to time. The pods are finished cooking when the liquid is cloudy, slightly thicker and the pods have gone a light yellow/brown colour. Cooking time will depend on the quantity you have. It's important that you're patient with this step as this is where the pectin comes from - the stuff that will thicken your jam. 3. Strain the pods, reserving the liquid. Discard the pods. 4. 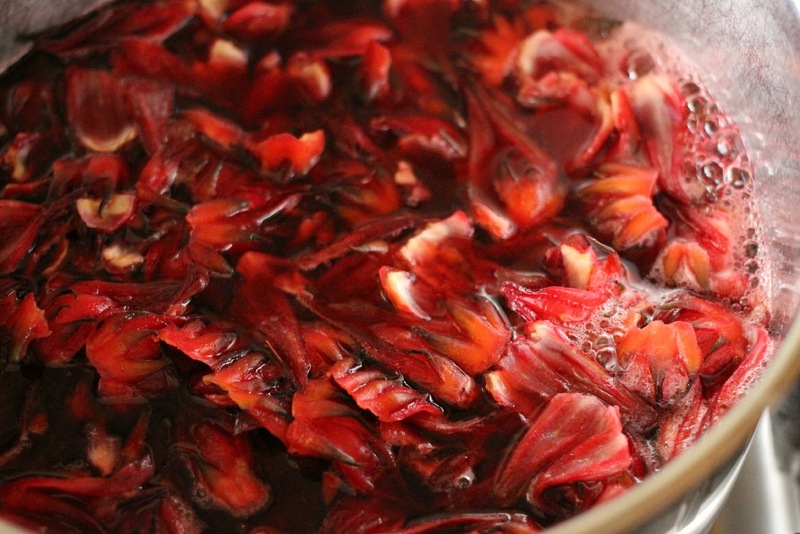 Return the strained liquid to the saucepan with the rosella petals. You'll probably need to add some water here so that the jam doesn't burn. 5. Return the saucepan to the heat and bring the petals to a simmer. Cook them gently, stirring often, until the petals soften. You'll notice when you arrive to stir it that they have suddenly deepened in colour and cooked down a bit. This should take around 15-20 minutes. 6. Now you add the rapadura. Having measured your petals in step 1, add the required amount of rapadura and stir well for several minutes until the rapadura has dissolved. 7. Lower the heat so that the jam is gently simmering away. It needs time now to simply thicken and turn into jam. It's a gentle process. Stir it regularly to avoid burning. It should take another 20-30 minutes, again depending on the quantity. 8. To test if the jam is reading, take a teaspoon and put it onto the chilled plate. Pop it into the freezer for a minute. If it has thickened upon cooling in the freezer, it's ready. 9. Remove from heat and allow to cool slightly before bottling into your prepared jars. Thanks so much for sharing this with us! Have a lovely weekend! You're more than welcome :-) Thank-you for your lovely comment - it gave me a giggle!